If the ruling class has lost its consensus, i.e., is no longer “leading” but only “dominant,” exercising coercive force alone, this means precisely that the great masses have become detached from their traditional ideologies, and no longer believe what they used to believe previously. The crisis consists precisely in the fact that the old is dying and the new cannot be born; in this interregnum a great variety of morbid symptoms appear. (Gramsci 1971, 276). Although Gramsci’s theorization was a critique of the specific historical conjuncture that supported the rise of European fascisms in the 1930s, the materialist lens he forged provides an invaluable tool to understand the cyclical crises of hegemony that have affected Western capitalist societies through the twentieth century. In the notes that follow, I would like to argue that the “great variety of morbid symptoms” characterizing the present historical moment—specifically, the rise of right-wing populisms across the Western world—signals a crisis of hegemony of the neoliberal regime of capital accumulation sustained by liberal/centrist political parties and a rearticulation of class power along authoritarian lines. (b) Second, authoritarian populism denounces the undue advantages (e.g., wasteful welfare, reverse discrimination, permissive rights, lax borders, tolerant law enforcement) supposedly enjoyed by the more underprivileged groups at the hands of a self-serving liberal power elite. (c) Third, it equates—in a sort of zero-sum game—the improvement of social conditions for the deserving social groups with the cultural/political/institutional marginalization of the undeserving social groups (e.g., through criminalization, discipline, surveillance, deportation). In this context, cyclical moral panics—triggered by political elites and amplified by corporate media—pave the ground for authoritarian law-and-order by equating street crime with a threat to the personal safety of law-abiding citizens by the racialized poor; illegal immigration with a threat to the social mobility of working Americans by criminal aliens; terrorism with a threat to American values by enemy civilizations; welfare with a threat to taxpaying Americans by an irresponsible underclass; and LGBTQ rights with a threat to the stability of the American family by pathological subcultures. (a) First, social movements should work towards overcoming the single-issue orientation of most current politics and, most importantly, the “non-profit industrial complex” that sustains this paradigm of political action (including forms of “professional activism”). (b) Second, we should overcome any simplified and depoliticized notion of privilege as an individual feature that subjects can somehow un-learn—for example, by adopting proper “technologies of the self” (Foucault 1988). This also means overcoming the self-congratulatory rhetoric about individual trajectories of healing, awakening, self-care, etc. These models are not only compatible with the dominant neoliberal ethos of personal responsibility and individual achievement, but they are building blocks of its renewed hegemonic hold. (c) Third, we should be wary of the creation of institutionally coopted (if not state-sponsored) “safe spaces” that end up reinforcing dominant notions of safety as personal security from individual aggressions; particularly when promoted or coopted by institutions eager to prevent insurgent mobilizations (e.g., university campuses), such spaces may become tolerated reservations for injured identities that work effectively to soften any opposition to structural inequalities. Liberated spaces are not assigned by powerful institutions; they are taken from them. (d) Finally, against the proliferation of court-actionable claims to “injured statuses” as the main form of resistance to white supremacy, we need to build intersectional communities of struggle: we need to engage in political action that acknowledges and organizes the plural nature of our movements, while at the same time consolidating stable political formations tasked with carrying forward the unique cause of the construction of the common. In this project, oppressed identities (the ones imposed by racial capitalism) must become visible against the color-blind nature of contemporary racism, the gender-blind nature of contemporary sexism, and the class-blind nature of contemporary capitalism. However, the ultimate aim of our insurgent politics should be the abolition of any “identity as property” (to paraphrase Cheryl Harris)—that is, liberation from identity as an organizing principle of any social hierarchy. Michael Hardt and Antonio Negri (2009, 331) frame this idea in terms of a distinction between mere emancipation, which is still anchored to the dominant framing of identity, and liberation, which requires instead a complex articulation of singularities. It is in this sense that Frantz Fanon (1967, 8) notoriously advanced the controversial statement “I propose nothing short of the liberation of the man of color from himself”. In conclusion, against the abstract and amorphous notion of “the people” invoked by authoritarian populism, at the same time uncritically undifferentiated and profoundly divided, we should mobilize the concrete reality of insurgent singularities fighting at the same time against a multiplicity of intersecting oppressions and toward the common goal of a post-capitalist society. Bruff, I. 2014. “The Rise of Authoritarian Neoliberalism.” Rethinking Marxism, 26(1): 113–29. Cacho, L. M. 2012. Social Death: Racialized Rightlessness and the Criminalization of the Unprotected. New York: New York University Press. Foucault, M. 1988. “Technologies of the Self.” In Technologies of the Self: A Seminar with Michel Foucault, edited by L.H. Martin, H. Gutman, and P. Hutton, pp. 16–49. Amherst: University of Massachusetts Press. Gramsci, A. 1971. Selections from the Prison Notebooks. New York: International Publishers. Hall, S. 1985. “Authoritarian Populism: A Response to Jessop et al.”. New Left Review, 151: 115–24. Hardt, M. and A. Negri 2009. Commonwealth. Cambridge, MA: Belknap Press. Yamahtta-Taylor, K. 2016. From #BlackLivesMatter to Black Liberation. Chicago: Haymarket Books. *Alessandro De Giorgi is Associate Professor at the Department of Justice Studies, San Jose State University (e-mail: alessandro.degiorgi@sjsu.edu). His teaching and research interests include critical theories of punishment and social control, urban ethnography, and radical political economy. He is the author of Rethinking the Political Economy of Punishment: Perspectives on Post-Fordism and Penal Politics (Ashgate, 2006). Currently, he is conducting ethnographic research on the socioeconomic dimensions of concentrated incarceration and prisoner reentry in West Oakland, California. 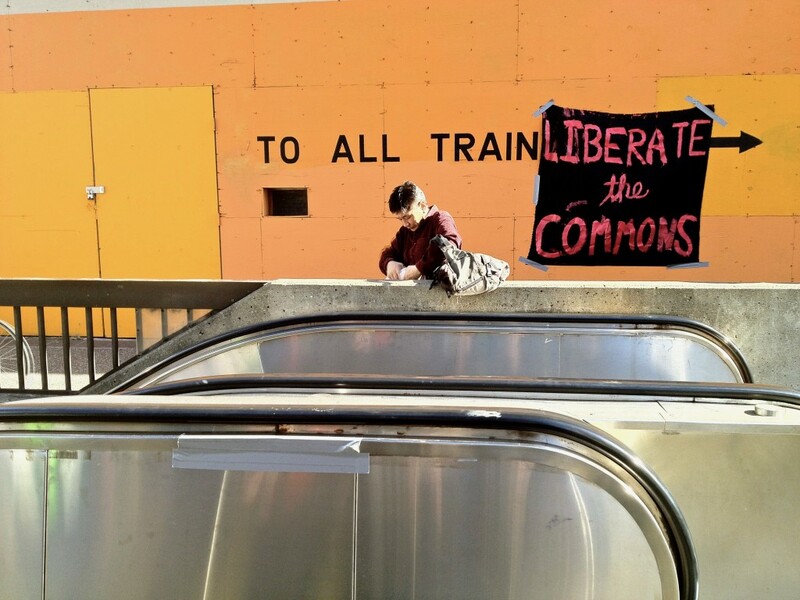 Image: “Liberate the commons,” © Social Justice.